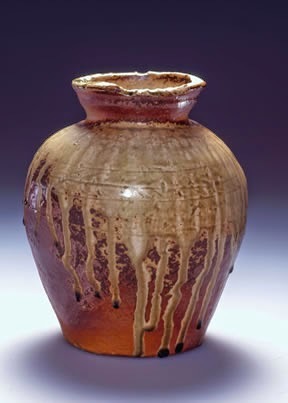 As I noted in a recent post, ceramics, as an art medium rather than a utilitarian craft, has become popular with artists. In fact, discarding functionality for the more purely aesthetic or expressive is happening to all the applied arts: textiles, glass, graphic design. I've even seen jewelry and fashion that's so wildly outlandish it really isn't intended for ordinary wear. There's a history in the evolution of ceramics that can put this phenomenon in context and enrich our understanding of it. 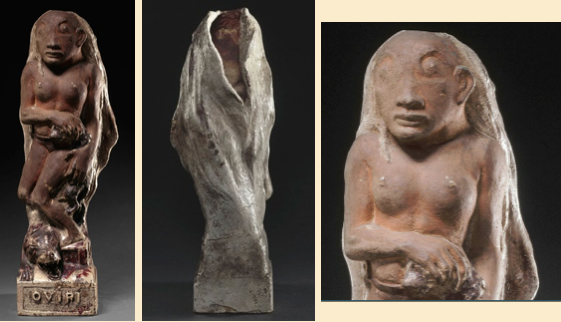 Clay has long been used as a medium for sculpture – prehistoric figurines, Japanese Haniwa, Greek vases, etc.. But for whatever reason, ceramics was shunned as a medium for sculpture during much of the past few centuries. It was considered a craft – an applied art limited by the requirement that it produce something functional, like a plate or a vessel of some sort. As a craft, it was considered inferior to fine art. 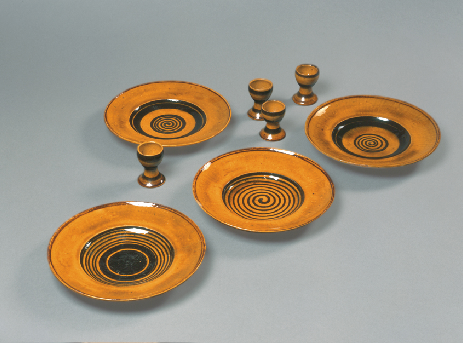 The Bauhaus improved matters a bit by treating ceramics, and the other applied arts, with the same respect as fine art. Nevertheless, it was assumed that ceramics, along with the other crafts, would serve a utilitarian purpose. Peter Voulkos was the first person to radically change a craft medium into a viable art medium, some seventy-five years ago. Few people have had such an impact on an art medium as Voulkos, both as an innovator and as an inspiring teacher. Peter Voulkos in his Glendale Blvd. studio with Black Butte-Divide, 1959. 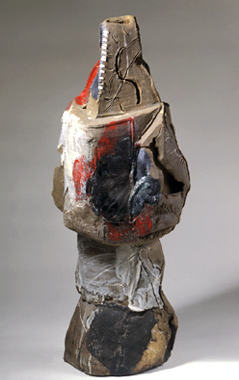 When I came to Los Angeles in 1965, Voulkos and his students John Mason, Ken Price and others at the Otis Art Institute (they were typically referred to as the "Abstract Expressionist Ceramicists"), were regularly exhibited in major galleries and museums, but almost no notice was taken in the rest of the world, including New York. And, with the notable exception of Ken Price, it’s still pretty much the case. 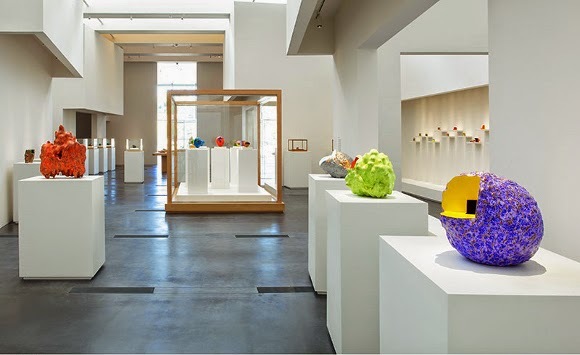 Installation view, Ken Price Sculpture - A Retrospective, September 16, 2012 - January 6, 2013, (Los Angeles County Museum of Art, © Ken Price. Photo © Fredrik Nilsen). I believe this is about to change. The fact is, Voulkos is relevant today for the influence, direct or indirect, he's having on many vital young artists. 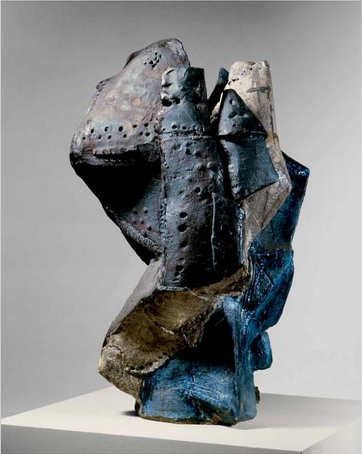 Until recently, Voulkos's sculptures looked dated, like a lot of the Abstract Expressionist sculpture of this period. Rather than being colorful, polished and relatively minimal like the ceramic sculptures of Ken Price, Voulkos' work looks rough, handmade – what is referred to today (in a good way) as "sloppy craft." Also there is an emphasis on surface texture and materiality in his work. Peter Voulkos, Little Big Horn, 1959, polychromed stoneware, 62 x 40 x 40 inches (Oakland Museum of California). These are just the things that interest some of the most adventurous artists today. In contrast to the over-produced, highly polished art commonly found in Chelsea, there's a refreshing authenticity about handmade art. There's also a growing interest in surface and materiality (perhaps from a discontent with video). You can see evidence of these trends in Bushwick – one of the most vital art scenes in the world right now. (See my posts on Bushwick Open Studios here and here.) 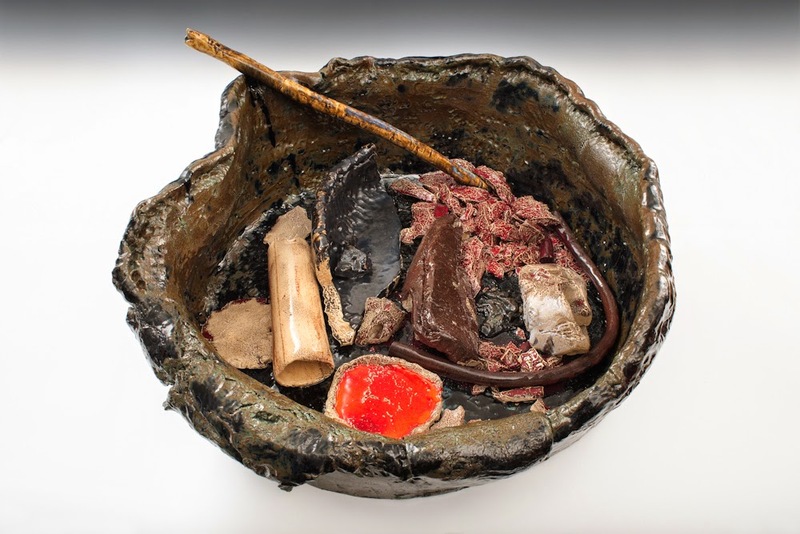 And Voulkos has had a direct influence, in this respect, on many important young ceramic artists, Sterling Ruby, Kathy Butterly, Nicole Cherubini, Arlene Shechet, Jessica Jackson Hutchins among them. Installation view, Arlene Shechet, solo exhibition at Sikkema Jenkins & Co., 2013. 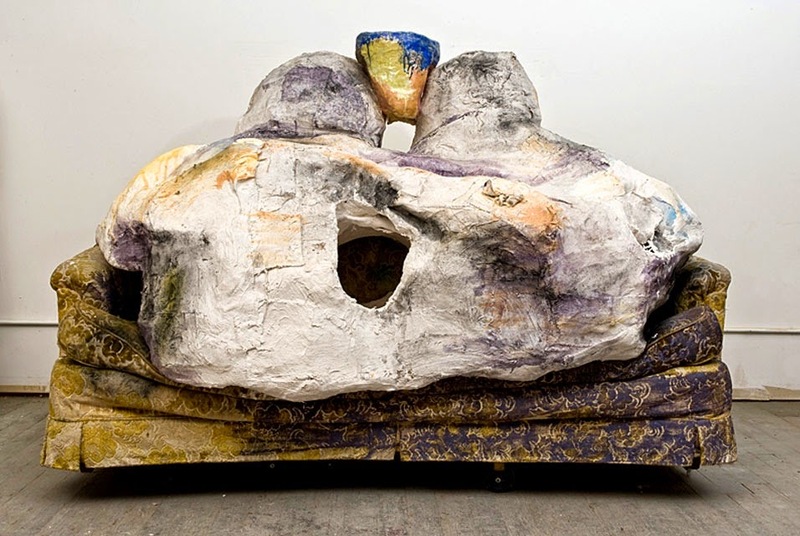 Jessica Jackson Hutchins, Couple, 2010, couch, ink spray paint, charcoal dust, hydrocal, ceramic, 52 x 67 x 38 inches (Derek Eller Gallery). Sterling Ruby, Basic Theology, 2013, ceramic, 20 ½ x 42 ¾ x 44 inches. So what about Voulkos? What in particular did he do that was so revolutionary? His major artistic breakthrough, in the early 1950s, was to create abstract ceramic sculptures from parts of wheel-thrown pots; that is, to build ceramic assemblage sculptures rather than monolithic vessels. He thereby not only broke away from the utilitarian, but he was no longer limited by what could be thrown on a wheel in one shot. 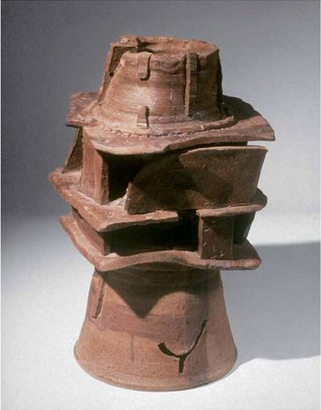 Peter Voulkos, Untitled, 1956, stoneware, 20 x 14 x 15 inches. 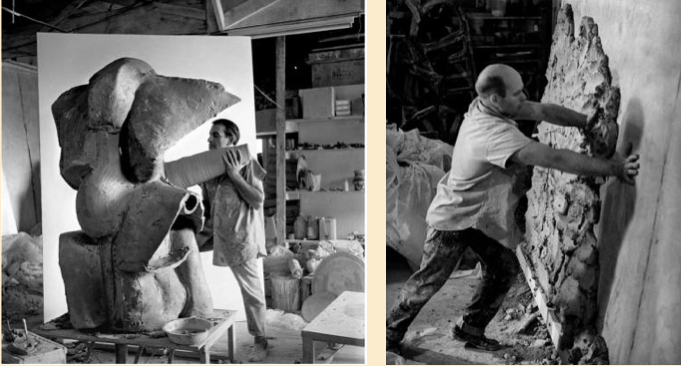 Later Voulkos innovated the use of epoxy glue rather than kiln firing to join parts, and epoxy paints along with colored glazes to add color to the sculptures. Peter Voulkos, Red River, ca. 1960, stoneware with slip, glaze and epoxy paint, 37 x 12 ½ x 14 ½ inches (Whitney Museum). 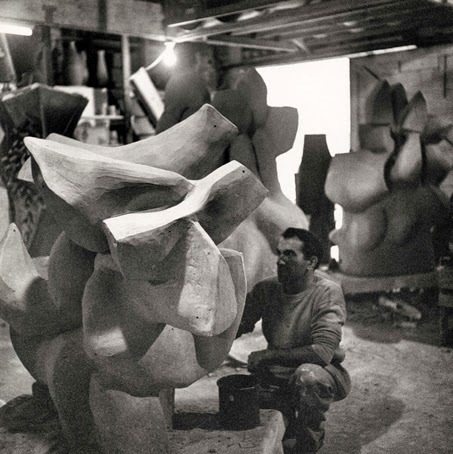 The other big innovation, large-scale ceramic sculpture, Voulkos developed with John Mason, one of his older and more advanced students. They shared a studio from 1957 until 1965 when Voulkos moved to Berkeley. (Update: See Frank Lloyd's clarification in the comments section below.) With the advice of Mike Kalan, a ceramics engineer, they built two industrial-size kilns capable of firing sculptures up to six feet high. Peter Voulkos and John Mason in their shared studio, late 1950s. In addition to being a great innovator, Voulkos was an inspiring teacher and, with his students, he spawned the "Abstract Expressionist Ceramics" movement. He was sociable, charismatic, rebellious and extraordinarily energetic. He was about the same age as his students, and he treated them more like colleagues than pupils. He worked alongside them and they exchanged techniques and ideas. Most important, since all Voulkos's students came from the crafts world, he introduced them into the fine arts world, and to the different intentions and values of that world. 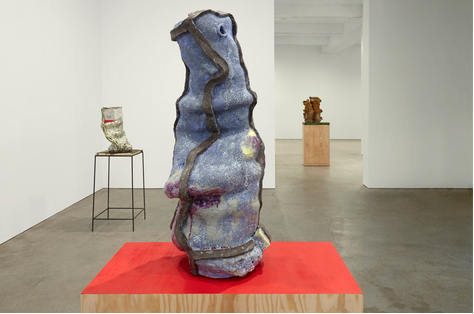 Installation view, John Mason, ceramic, 2014 Whitney Biennial. In addition to Ken Price and John Mason, the other Abstract Expressionist Ceramicists incude: Billy Al Bengston, Michael Frimkess, Mac McClain, Jerry Rothman, Paul Soldner, and Henry Takemoto. And in 1959, when Voulkos moved to the University of California at Berkeley, James Melchert and Ron Nagle came under his influence. * I'm grateful to my friend Ken Garber who loaned me his informative unpublished 1973 thesis about these artists. It helped put their achievement in context. To prevent this post from getting clogged up, I heavily edited it. Here are some of the things I left out. Feel free to skip it if you want! and online, there is an article by Garth Clark, and several posts in the Frank Lloyd Blog. The Museum of Modern Art lists no work on their extensive website by Mason or Peter Voulkos, and only four minor lithographs by Ken Price – no ceramics. I contacted MoMA to find out if they owned work that wasn't on their site, and they said they had a Voulkos vase from 1956, and nothing by Mason. 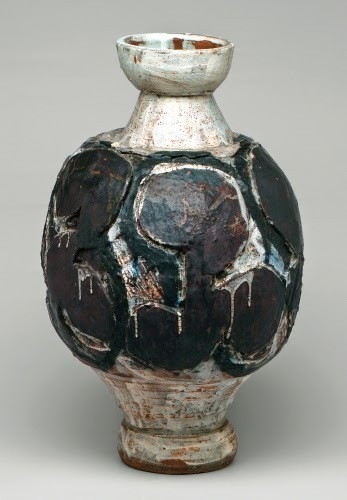 Peter Voulkos, Jar, ca. 1956, stoneware, 22 inches high (MoMA). The Metropolitan Museum of Art lists some 400,000 works on their website including more than one thousand ceramic works from 1900 to the present, but nothing by Voulkos, Mason or even Price who was just given a major retrospective there. The Met did have a show of some work by Voulkos and Mason in 1998 as part of a small contemporary ceramics exhibition installed in a glass display case on the Great Hall Balcony. Not the most prestigious space, but it's something – and they continue to occasionally exhibit contemporary ceramics there. There are a few museums that seriously collect and exhibit ceramics: the Los Angeles County Museum of Art, the Carnegie Museum of Art, in Pittsburgh, and the Hirschhorn Museum in Washington D.C..
Of course, there have been exceptions to the functionality requirement, such as Gauguin's disturbing stoneware sculpture that made me gasp every time I saw it at the recent Gauguin exhibition at MoMA. It's difficult to see in reproduction, and not easy in person either, but at her feet is a bloody wolf that she probably killed, and she’s holding a wolf cub – probably the cub of the dead wolf. This was Gauguin's last sculpture, and his biggest. He considered it his masterpiece and wanted it placed on his tomb. Front, back and close-up views of Paul Gauguin’s Oviri (Savage), 1894, partly enameled stoneware, 29 1/2 x 7 1/2 x 10 5/8 inches (Musée d'Orsay, Paris). And needless to say, there's nothing wrong with craft ceramics; in fact, all of the ceramicists discussed here continued to make functional objects their entire careers. And, of course, some of the greatest, most breathtakingly beautiful art in the world is functional. Unknown artist, Qing dynasty vase, 1713-22, porcelain with peach-bloom glaze, 7 ¾ inches high (Metropolitan Museum of Art). In 1954, when Voulkos still considered himself a craftsman, Rosanjin, a well-known Japanese ceramicist, had an exhibition at the Los Angeles County Museum of Art (LACMA) that impressed Voulkos because the work was less refined than traditional pottery. Rosanjin's Zen aesthetic allowed for more chance and improvisation in the making, and for asymmetry and imperfection in the end product. 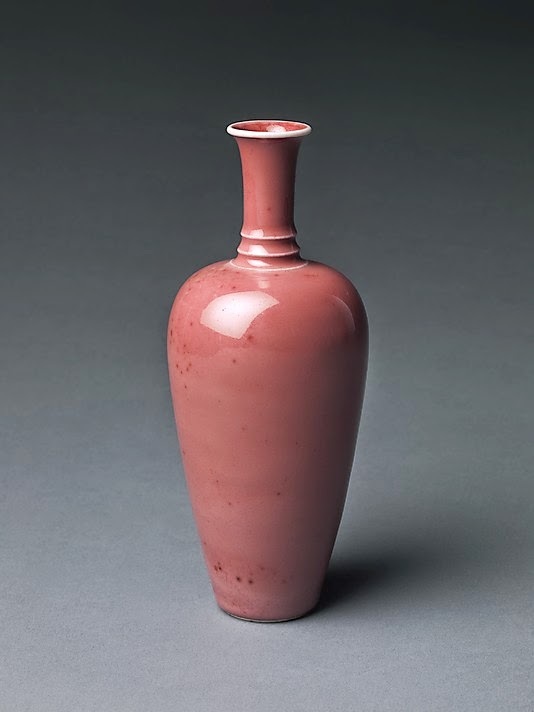 In addition, even though Rosanjin continued to make functional vessels, he repudiated the craft tradition and declared himself a fine artist. Rosanjin, Jar, 1954, 8 ½ inches high. Joan Miró worked with ceramics in 1947-48 and again in 1953-56, and Voulkos saw some at a 1959 Miró exhibition at the Los Angeles County Museum of Art (LACMA). 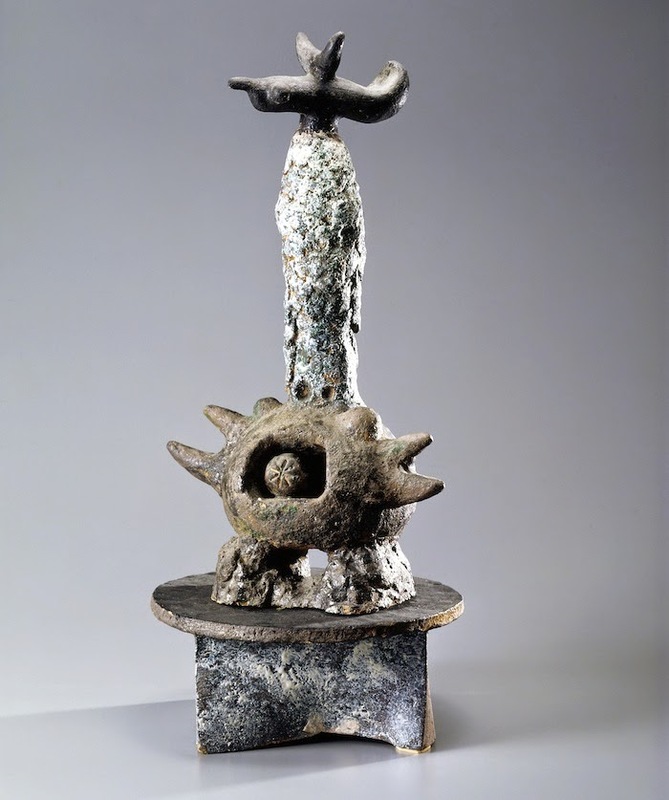 Joan Miró, Monument,1956, earthenware, 28 1/4 x 12 3/4 x 12 3/4 inches (courtesy of the Chazen Museum of Art, University of Wisconsin-Madison, Terese and Alvin S. Lane Collection). Especially influential were the ceramics of Picasso who made a mind-boggling 2000 ceramic pieces in 1947-48, and even more in 1953. 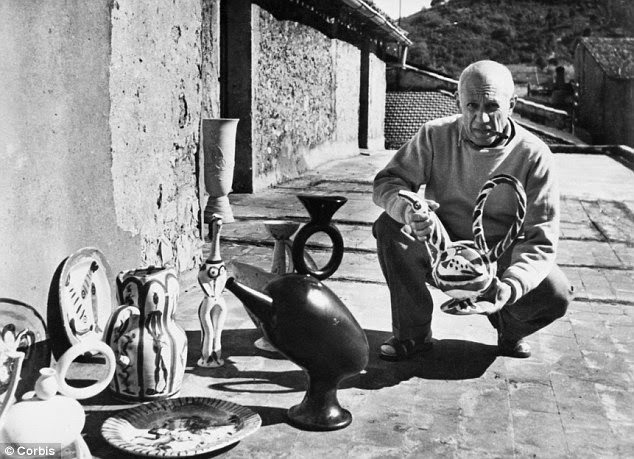 Pablo Picasso with some of his painted ceramic works at his studio at Vallauris. They were impressed that Picasso and Miró didn't stop after the pot was thrown, but continued working on it, manipulating it, cutting it, and using the clay surface as a medium to paint on. And just the fact that artists with the stature of Picasso and Miro (and, BTW, Fernand Leger) made ceramics lent credibility to the medium as a fine art. 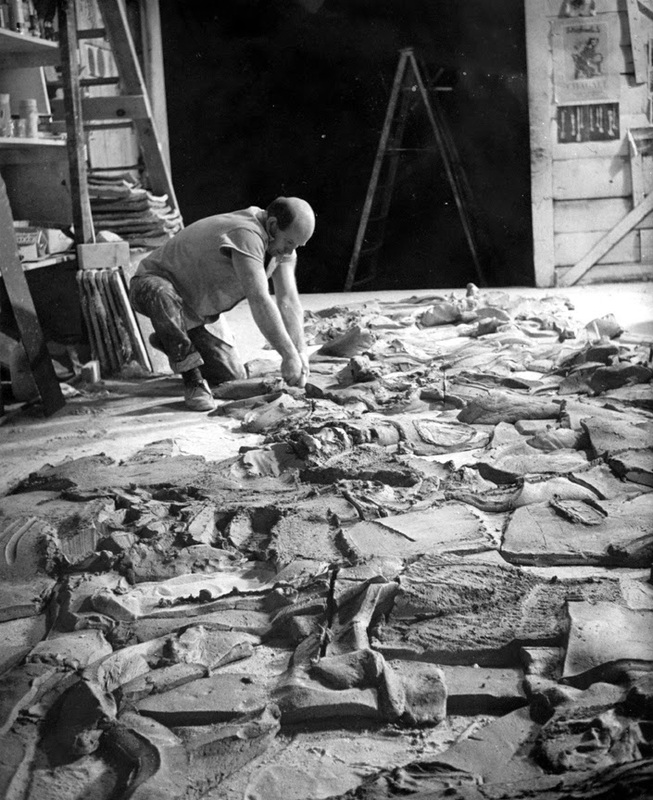 But perhaps the biggest impact on Voulkos was the time he taught at Black Mountain College (BMC) in the summer of 1953, then a hotbed of experimental art activity. Because Voulkos was naturally sociable, he quickly became friends with many of the other teachers, especially the poet Charles Olson, the composer David Tudor and the painter Jack Tworkov with whom Voulkos traded work. He also met Robert Rauschenberg, Merce Cunningham, and John Cage whose performances profoundly impressed him. And Voulkos spent time in New York where he hung out at the Cedar Bar and befriended Franz Kline and many of the other Abstract Expressions. Voulkos pinned black and white photos of Picasso’s ceramics to his studio wall as inspiration for himself his students. They thought the work in these photos was more brightly colored and bigger than they actually were, which is significant since that might be one reason they ended up producing larger and more colorful ceramics. John Mason, the other great innovator, experimented with the properties of clay, pushing it to its technical limits of thickness, size and weight. He did away with the throwing wheel altogether and instead he would slam large hunks of clay to the floor, mold them, join them together, cut them up into smaller sections that could be fired without exploding, and, after firing, join them together again into large ceramic walls. This was as close to "Abstract Expressionist Ceramics" as it ever got. John Mason working on Blue Wall, 1959 (Photo from Frank Lloyd's blog). 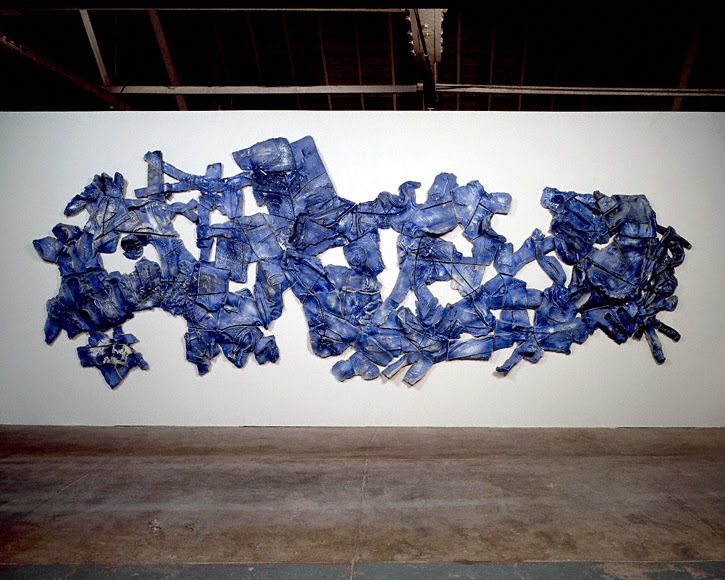 John Mason, Blue Wall, 1959, ceramic, 96 x 252 x 8 inches (collection of the artist. Photo by Anthony Cuñha). Ken Price, G.L. 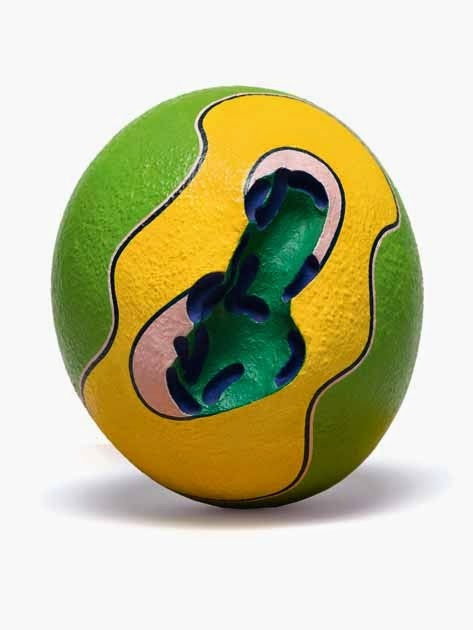 Green, 1964, fired and painted clay on a wood base, 6 1/4 x 5 x 5 inches, Betty Lee and Aaron Stern Collection © Ken Price (from Ken Price, A Retrospective at the Nasher Sculpture Center, Dallas, 2013). 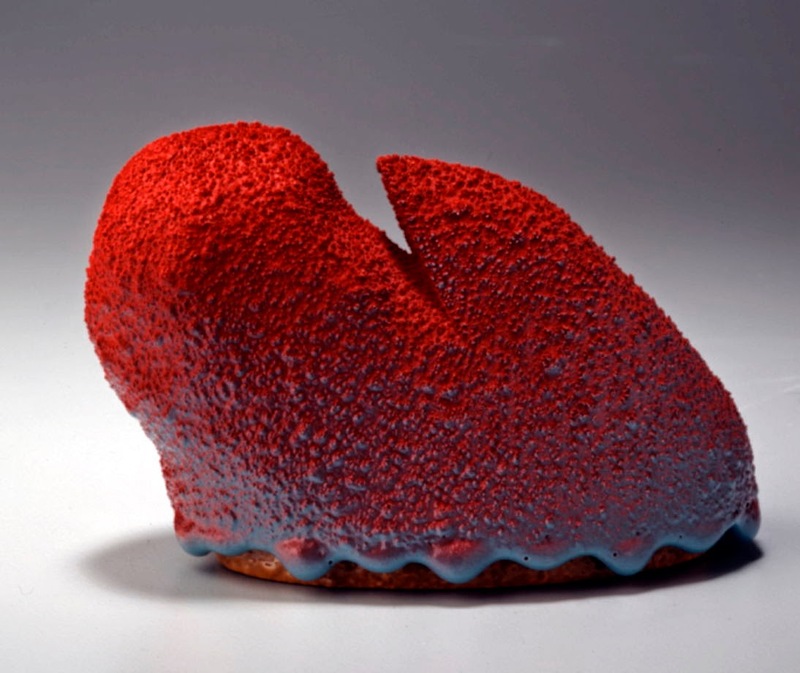 Ron Nagle, Red and Turquoise Knob Job, 1984, glazed earthenware, 2 ⅞ x 4 ¼ x 2 ¼ inches (de Young Museum, San Francisco). The others were (and are) all over the place from Pop to Funk to traditional craft pottery. Michael Frimkess, Jumpin' at the Moon Lodge, 1968, glazed stoneware, no size noted (Scripps College Collection). Jerry Rothman, Covered Olympic Vessel, ca. 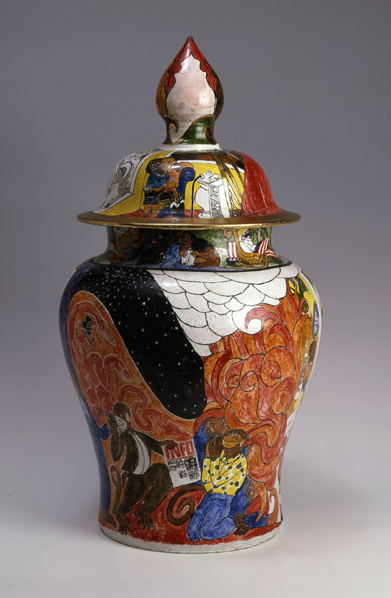 1984, glazed earthenware with colored oxides in sand, 32 ½ x 11 inches. UPDATE: The Los Angeles Times just published an obituary for Jerry Rothman. 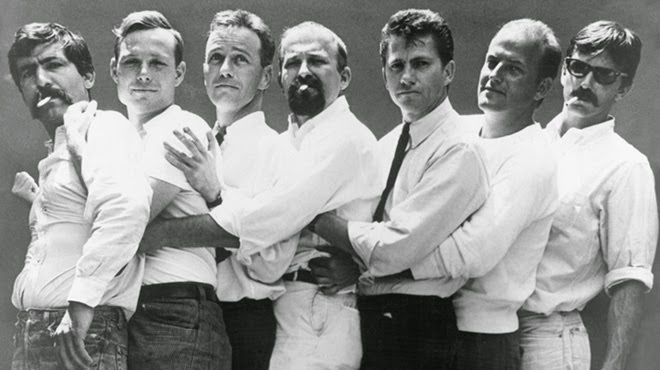 The Ferus Gallery Artists, 1959; from Left: John Altoon, Craig Kauffman, Allen Lynch, Ed Kienholz, Ed Moses, Robert Irwin, Billy Al Bengston (photo: Patricia Faure). Probably due to this macho ethos, the only women ceramicists I found even alluded to during this period were Susan Peterson, who taught Mason the craft of ceramics before he went to Otis, and two full-time ceramics students at Otis – Carol Radcliff and Janice Roosevelt. But I've never seen any mention of them in relation to Abstract Expressionist Ceramics. Wonderful, inspired and interesting post Charles! Thank you for the over-view. I will be looking up many of the names you include here. I was aware of Voulkos as a high school student. We had an exceptional ceramics dept. and I spent many hours working in the clay studio. PV was a personal favorite of my teacher. The first Voulkos image you post of PV's sculpture--Little Big Horn 1959, reminds me of a Philip Guston painting but I guess that's not surprising with the abstract ex. connection. The Ferus photo of the artists is weird--very macho as you say in your piece....mucho-macho and physical. I really like Ken Price's work too. Can't wait to see the rock show that's up right now. Thank you Kyle, I worked hard on this post. It's nice you appreciate it. Better hurry to see the Ken Price shows (three of them! ), they close June 28th. I will hurry to see the shows--I also wanted to add that all the images and the connections you make here put a lot into perspective for me. I thank you for that. Really good post, Charles! One of the things that always puzzled me was the devaluing of clay as an expressive medium. Some of it may have been due to the technical difficulties of working with clay...shrinking, warping, cracking, that required a good deal of technical skill. But actually all media have their requirements and limitations. So I don't know. I do know lots of clay artists who really resented their 2nd class stature. In Asia, the tradition valued the work, regardless of the medium. Thanks Ken. I value your opinion. You mentioned once that, because of technical reasons with the firing, ceramics had to be fairly small. Maybe that's a factor too. But given how great ceramic art was over the centuries, it's still pretty inexplicable that ceramics as an art medium would be shunned. Charles, Your blog reminds me Peter Voulkos was one of the great 'originators'. I don't know if he ever credited Chinese Han ceramics but I see the slab walls and structuring very directly in Untitled, 1956, stoneware, 20 x 14 x 15". Also Jar, ca. 1956, stoneware, 22 inches high (MoMA) seems linked to Islamic 12/13th century jars. There was exchange between china and persia at that time along the silk road. Good point! Japanese Haniwa figures are another precedent. Does anyone know if terracotta is easier to use in slab construction than clay? "In archaeology and art history, "terracotta" is often used of objects not made on a potter's wheel, such as figurines, where objects made on the wheel from the same material, possibly even by the same person, are called pottery; the choice of term depending on the type of object rather than the material." So it's slab construction by definition. It's not because it's terracotta, but because it's not made on a potter's wheel. Your post on Voulkos has gotten me searching for his possible sources. the link i posted in above is a middle Jomon (around 5000 B.C.) pot the Met owns. The directness, primal power and piercings/holes is akin to the wonderful physicality in Voulkos work. I am amazed at how he synthesized sources. Incidentally, Jomon pots were likely made by women. In my understanding of the term, terra-cotta refers to a type of red earthenware clay body that can be used for whatever purpose. It can be glazed or unglazed. It is distinguished from stoneware and porcelain clay bodies primarily by the temperature at which it was fired. I believe that the Chinese were the first to develop kilns that could reach higher temperatures and clay bodies that matured at those higher temperatures. This allowed for the creation of work that was harder than earthenware, and thus non-porous. Thanks Ken. It's always great having your expertise. ....Voulkos preferred working "in the dark," he said with just a vague idea of the thing he wanted to bring into being. ...His ambition wasn't that of a traditional craft potter. It was that of an artist/potter. The aim had shifted from the social to the self. "When it comes right down to it," said Voulkos, "i have a very selfish attitude - I don't make pots for people but to satisfy myself. "(Conrad Brown.Craft Horizons, Oct 1956). ...in the fine arts, where the ceramics of Miro and Artigas resided, Voulkos' comment would have been seen merely as an obvious statement of the modern artist's task: to bring his personal vision to life. 50+ years later, the shift is back to the social as a kind of obligation --- and to create context. BTW, I'm thinking that I should have made more of Miro's influence on Voulkos. After all, Miro left functionality in his ceramics, but Picasso never did. One distinction that has not been brought up in the on-going discussion is that between "production potter" and "studio potter". Studio potters focus on producing one of a kind pieces that may or may not have functionality as part of their purpose, whereas production potters try to create works that are well-crafted in both the aesthetic and utilitarian sense and are usually produced in larger numbers per series. So studio potters in a way bridge a gap between craftsmen and sculptors. But to me the gap is arbitrary. An object that engages me aesthetically is a work of art, regardless of its functionality. Re: Picasso and Miro. I think Picasso abstracted from in all his work – from body, guitar, vase- as opposed to non-objective. In my limited knowledge of his ceramics, there is evidence of the source pot that was cut up/re-formed. The pot was his starting point and a reference maintained. It was the pot form Picasso worked without regard for utilitarian purpose. Although Miro painted on vases and plates, it is the lumpy rocks and broken tiles fragments that I find the most compelling. The gravity less space of his ptgs is coupled with the feeling of cave drawings. Miro did not build in clay but would take “pebbles, shells, bits of driftwood, and debris of all kind from the sea, and I also took squash from my garden. These forms were interpreted in clay…”(Rosamund Bernier) by the remarkable Artigas who also made up enamel glazes to replicate the bright colors Miro preferred. I would not have made Miro connection to Voulkos had I not stumbled on Miro; Playing With Fire. I think the 'Ceramics Revolution' is apt considering the prevailing approaches in the 50's. Craft Horizon published Dore Ashton's article on Miro and Artigas in Feb 1957 which Voulkos probably saw. It met with unhappy letters to the editor. Stepping outside the utility of craft was akin to apostasy, it seems. There was a good deal of resistance to the use of clay for sculptural or non-utilitarian work as can be seen in the letters written to Ceramics Monthly magazine in the 60's and 70's by traditional potters. Many felt that the craft of pottery had finally been revived after having been almost obliterated by factory made ware. So to see a magazine article dedicated to other uses of clay did seem an apostasy. I guess I missed this post the first time around. Now that it's included in your round-up of your favorites, I've had a chance to read through and to glance at the comments. I appreciate your overview of the topic, which is an area I've done considerable research on. I also appreciate your inclusion of links to my blog. If, however, any of your readers are truly interested, the publication that accompanied the exhibition "Clay's Tectonic Shift: John Mason, Ken Price, Peter Voulkos, 1956--1968." is filled with further information, as well as the most comprehensive bibliography about the subject. The catalogue for the exhibit, which was a Getty Foundation-sponsored exhibition and publication produced in conjunction with Scripps College, also includes highly researched essays by Karen Tsujimoto (former curator at the Oakland Museum), Michael Duncan (an award winning independent curator and essayist/critic for Art in America), and Mary McNaughton (Art Historian and Professor of Art History at Scripps), and a compilation of interviews done by Suzanne Muchnic. The publication was a significant contribution to scholarship about this period of time, and the authors chose to focus on the main figures in the transition to ceramic sculpture. For Voulkos, there was already a publication that accompanied a touring retrospective organized by the Oakland Museum, with essays by Tsujimoto as well as Rose Slivka. A clarification is in order: The Howard and Jean Lipman collection isn't all ceramics! It was formed as the basis for the Whitney's sculpture collection, and did include works by Ken Price (an early "Egg" sculpture) as well as Peter Voulkos (Red River, which you have reproduced). 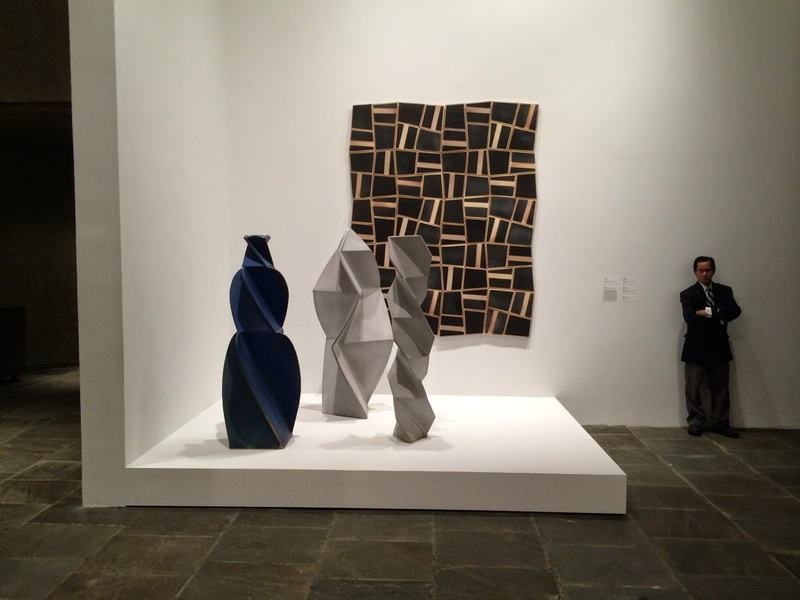 However, it is best described by their son, who told me in an interview; "in 1964 [Howard Lipman] approached Jack Baur, who had moved up from Curator to Associate Director at the Whitney with a proposal to form a special sculpture collection representative of its time at the Whitney. The focus would be on young artists, and the collection would be first exhibited at the Whitney and then tour other museums across the country. An initial gift of 30 contemporary works that were already in the Lipman collection was to be supplemented by acquisitions selected jointly in collaboration with museum staff as a continuing program. A first selection of 45 pieces was exhibited in 1966, 47 more in 1969, and a more-comprehensive third selection of about 180 pieces in 1980." Works are by many others, and Peter Lipman clarified with me an exact list of the artists include. Media are quite varied--from all over the country, including several from the West. At any rate, I found the post to be informative and a good summary. For anyone with continued interest, I'd highly recommend the publication "Clay's Tectonic Shift.' I am the lead essayist, and served as co-curator with Kirk Delman, the Collections Manager at Scripps College. Separately, I'd suggest a couple of name corrections, as well as some date corrections/notations. The young LA-based sculptor is STERLING RUBY, not Ruby Sterling as you have it in the text. (The image caption for his work is correct). Also, for the Whitney sculpture collection, it was donated by Howard and JEAN Lipman, not Jane as in your text. As an interesting note, Peter Lipman, their son, told me; "In addition to my father's service on the Board of Trustees (1968-1985), my mother became editor of publications at the museum, after leaving Art in America in 1970. She also worked with the director and staff on special projects and exhibitions and coordinated publications which she originated for the museum." Also, Voulkos really moved to UC Berkeley in 1959. He continued to come to LA at times, to use the studio and kiln he shared with Mason, until a time in the early sixties---but not 1965. By that date, Voulkos had a bronze foundry in Berkeley called "Garbanzo Works", which he started with Harold Paris and Don Haskins. Thanks for posting my previous comments. In re-reading your post, I'd suggest that some of the technical comments be incorporated by edit into your post . For instance, our mutual friend Ken Garber is absolutely correct in reminding us that "terra-cotta refers to a type of red earthenware clay body that can be used for whatever purpose. It can be glazed or unglazed. It is distinguished from stoneware and porcelain clay bodies primarily by the temperature at which it was fired." PLEASE don't use Wikipedia as a technical reference. Better resources are available, and Ken Garber's excellent definition conforms to those. In your post you state that Peter Voulkos used epoxy glue to join the elements of his sculpture. Perhaps you may find this to be nit-picking, but the artist John Mason, who shared the studio with Voulkos, has stated in an interview for the Getty-sponsored Pacific Standard Time research project Clay's Tectonic Shift: "And I guess this might be one place to clarify that I sometimes read, by people who should know better, that Peter assembled his pieces with epoxy resins. That’s totally false. To my knowledge, he never built a piece starting from scratch with epoxy resins. He always used traditional methods." (Mason, John, interviewed by Frank Lloyd, June 24, 2010, grant provided by the Getty Foundation, on deposit at Ruth Chandler Williamson Gallery archives, Scripps College). Whitney's descriptive label for "Red River" refers to a possible overpainting of paint, not a joining material. Please correct this. Abstract Expressionist ceramics is a critical term invented by a writer and critic (and friend and colleague of Voulkos), John Coplans. It may have been an unfortunate category, as the exhibit at UC Irvine when Coplans first used the term in the fall of 1966 for an essay accompanying a show at UC Irvine, which later traveled to the San Francisco Museum of Art in 1967, clearly MUCH after the movement in painting. Finally, regarding "macho": Both of Peter Voulkos' wives, Peggy and Ann Adair, were ceramic artists. Peggy taught ceramics in Berkeley for decades; Ann Adair was an exhibiting artist (her signature sculptures were alligators). At Otis, there were women, too. As you mention, Carol Radcliff and Janice Roosevelt. Other ceramics schools in the Los Angeles era included USC, where Susan Peterson taught. The ceramics department of UCLA was founded by a woman, Laura Anderson, in the late 1930s. Vivika Heino, ceramics teacher and second graduate of Alfred University, knew Voulkos. Perhaps these women were not directly affiliated with so-called Otis (it was known as the Los Angeles County Art Institute at the time), but Peter was certainly aware of their work. Voulkos taught for 25 years at a coeducational University of California campus. Students at Berkeley included Marilyn Levine, the Canadian-born artist known for realism. Also American abstract painter Mary Heilmann, highly regarded for her multidisciplinary work that includes ceramics as well as furniture. Voulkos owned a building in partnership with a woman, Marilyn Levine. The archivist for Voulkos is Sam (Sandra) Jornlin. What's so macho about those relationships with women? As for the photograph that you find so objectionable of the Ferus artists, the picture was taken by a woman, Patricia Faure. Give her a photo credit please.